Write Under the Stairs – Write with us! I’m so excited about the youth programs planned for this summer at TT Patton! The lower level room, “Write Under the Stairs“, is complete and we have young writers here everyday during the 1st session of our Creative Writing Summer Camp. They write a little bit of poetry, a little bit of fiction, and a little short story. And the students journal at the beginning of each class in a journal THEY designed, using fountain pens THEY built. Oh and you must stop in to meet the creative soul that’s leading the youth programs at TT Patton this summer, Molly Koeneman. As an English major, she’s bringing all those creative juices from Western Kentucky University to Barrington and leading some really creative writing classes and camps. 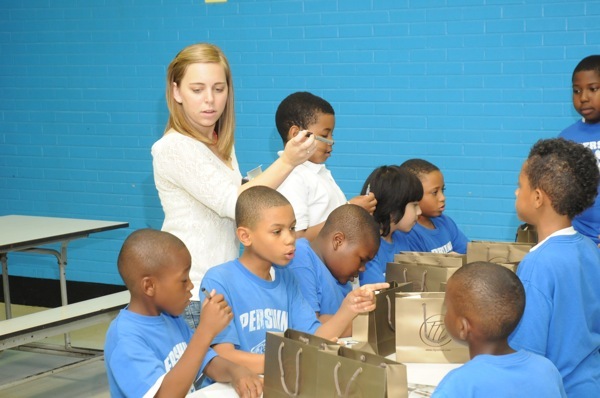 She even assisted with a Pens For Kids program sponsored by TT Patton and Lynn Green at the Pershing East Magnet School in Chicago. But it’s summer so Miss Molly makes sure the students are having fun at the same time. I think I even heard some cheering Write Under the Stairs this morning as they learned about mail delivery and decorated their own personal mailbox. Or maybe those were cheers about the US advancing in the World Cup. Miss Molly is a big soccer fan. Go team USA! Since every seat is filled in all 3 weeks of our Creative Writing Summer Camp, we’re adding a 4th session later in July. Stay tuned for the dates and times. Up next…calligraphy classes. Dena Bellows, with 35 years of experience, will teach morning calligraphy classes designed for students ages 11 to 14 this summer… Write Under the Stairs at TT Patton.